MOSCOW, September 13. /TASS/. World’s famous short track speed skater Viktor Ahn is still welcomed to take up the post of the Russian national short track team’s head coach, Alexei Kravtsov, the president of the Russian Speed Skating Union (RSSU), told TASS on Thursday. RSSU President announced last week that Russian national Viktor Ahn, made a decision to wrap up with his sports career. The 32-year-old athlete, who was born in South Korea, had been expected to become the head coach of the Russian national short track speed skating team, but he announced his decision to return home and declined the offer for the coaching job. "Our proposal about mutual cooperation is still in force," Kravtsov said in an interview with TASS. "I have told Viktor that we keep waiting for him to come back and will be always glad if he decides to work in Russia." Late last year, the International Olympic Committee (IOC) suspended the membership of the Russian Olympic Committee (ROC) over doping abuse allegations but allowed clean Russian athletes to participate in the 2018 Winter Games under the Olympic flag and in the neutral status of an Olympic Athlete from Russia (OAR). Viktor Ahn was not among the Russian athletes to receive an invitation from the IOC and missed the 2018 Olympics in South Korea’s PyeongChang. Viktor Ahn was born in South Korea’s Seoul as Ahn Hyun-Soo and initially competed for his native country’s team. At the 2006 Winter Olympics in Italy’s Turin he brought South Korea three golds and one bronze medal in short track. 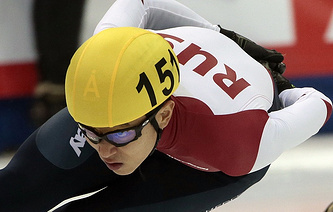 After the 2006 Olympics in Turin, a string of injuries kept him sidelined from major short track competitions and before the 2010 Winter Olympics in Canada’s Vancouver he failed to qualify for the South Korean national team. In 2011, he was granted Russian citizenship and announced his decision to speed skate for Russia at the 2014 Winter Olympics in Sochi, where he clinched three gold medals and one bronze medal. He is also the six-time Overall World Champion, winning the titles in 2003-2007 and in 2014.